The wedding of Bernard Cox and Miss Pemberton. See note below. Photo courtesy of V. Hopkinson. I was very excited to find this photo of my great grandparents – Robert Bernard Cox and Elizabeth Pemberton who were married at killamarsh Primitive Methodist Church on 5th May 1904. School & Robert worked at Bolsover Colliery. They moved to Bolsover after their wedding. Robert’s parents – Samuel and Mary Ann (nee Pollard) ran the post office and drapers shop on The Bridge South. Elizabeth’s father Joe Pemberton was a collier. Elizabeth died very suddenly in 1927 aged 49. Robert remarried and lived until 1948. 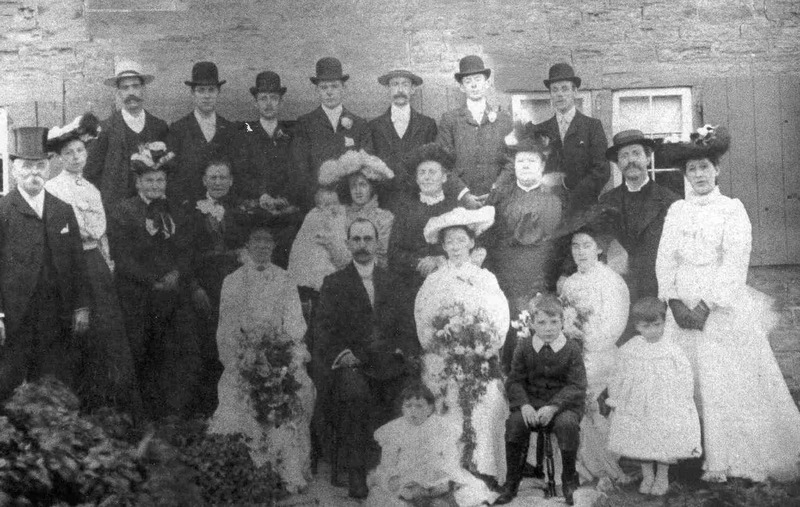 The wedding of Bernard Cox and Miss Pemberton, taken outside Mrs Cox’s home behind 2 to 6a High Street. On the left Albert Hopkinson, born 22 June 1851, his wife is Isaline Pollard Cox.